This tutorial will walk you through the creation of a sample application that contains RadGridView bound to RadEntityFrameworkDataSource. As of version 2013 Q3 SP1 we have added support for EntityFramework 6.0. You will need to reference the Telerik.Windows.Controls.EntityFramework60 assembly, rather than the Telerik.Windows.Controls.EntityFramework one in order for this to work. Note that RadEntityFrameworkDataSource is built on top of the ADO.NET Entity Framework. Basic Entity Framework experience is required for working with RadEntityFrameworkDataSource. Start Visual Studio and create a new WPF Application. Now that we have the application, we will add our entity model using the AdventureWorks database. In the project add a new ADO.NET Entity Data Model. You need to make sure that Data is selected from the left menu. 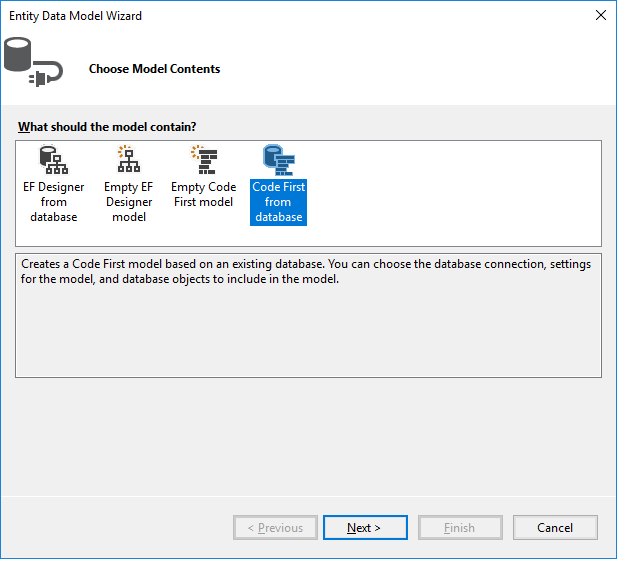 Choose to create a model using the code first approach from an existing database. Choose the data connection (for example the AdventureWorks database). In order to learn how to add the AdventureWorks database, check out the AdventureWorks Readme article. Generate the entities from all of the tables in the AdventureWorks database. Click Finish and rebuild the solution. Now let's go to the client side. 2. Now add the RadGridView and RadEntityFrameworkDataSource controls to the main window. Example 1 demonstrates how you can do that. 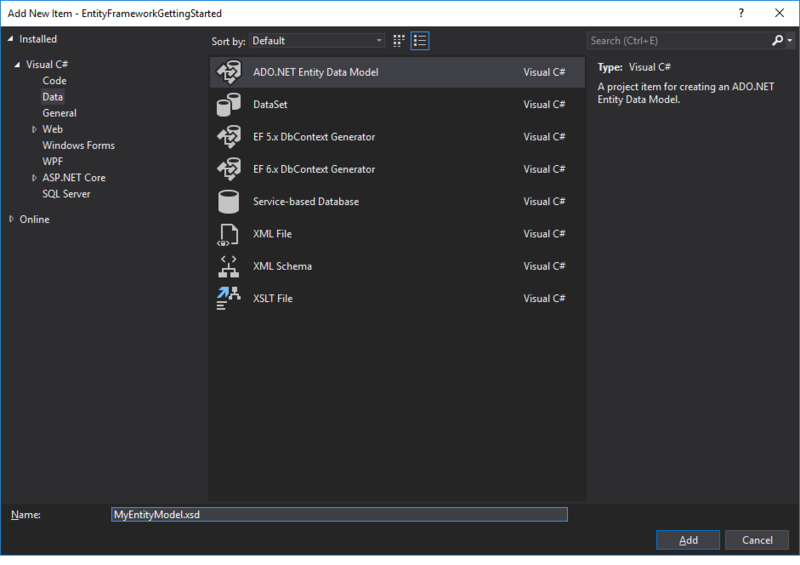 Since Q3 SP1 2012 we have added the RadEntityFrameworkDataSource.DbContext property which should be set instead of the ObjectContext property for versions of Entity Framework newer than version 5.0. If you are using an older version of Entity Framework, you can set the RadEntityFrameworkDataSource.ObjectContext property. The QueryName points to the query of the data source. DbContext - points to the context that has been created. DataView - the data that comes from the query is stored in the DataView property, so we bind the RadGridView to it.